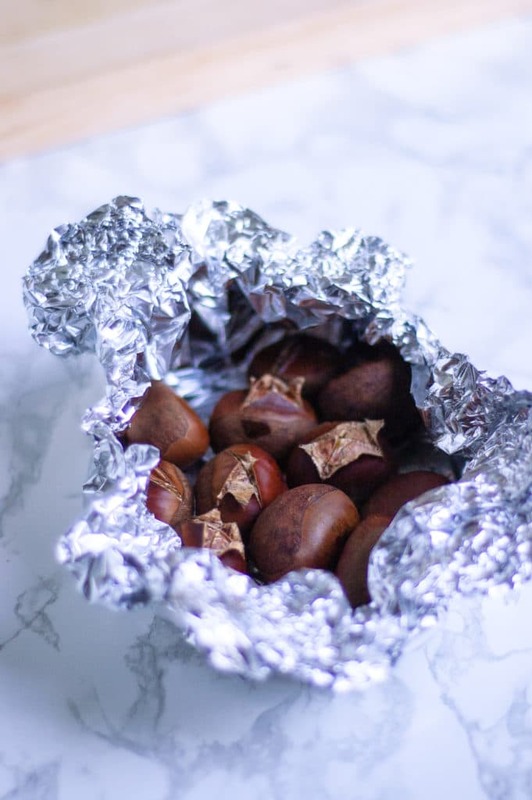 Learn how to roast chestnuts in the oven and the 4 major things you need to know for success. Plus recipes to use your roasted chestnuts. Chestnuts roasting on an open fire. . . If you’ve ever wondered, “How the heck you roast chestnuts?!?! ?”, or “Do you really need an open fire for that? It sounds dangerous?!?! ?” then today’s post is for you! The shell has to be cut or broken before cooking. There needs to be steam to help separate the shell from the nut. The shell has to be removed while the nuts are hot. When they cool down, they become increasingly harder to peel. There is a second fuzzier layer around the chestnut that sometimes grows into the ridges of the nut. Do an extra inspection to make sure you have removed it all. As you can see, you have a little work ahead of you. Don’t worry though, I have tips to help you with that. Because chestnuts cool down rather quickly, I find it easiest to work in batches. 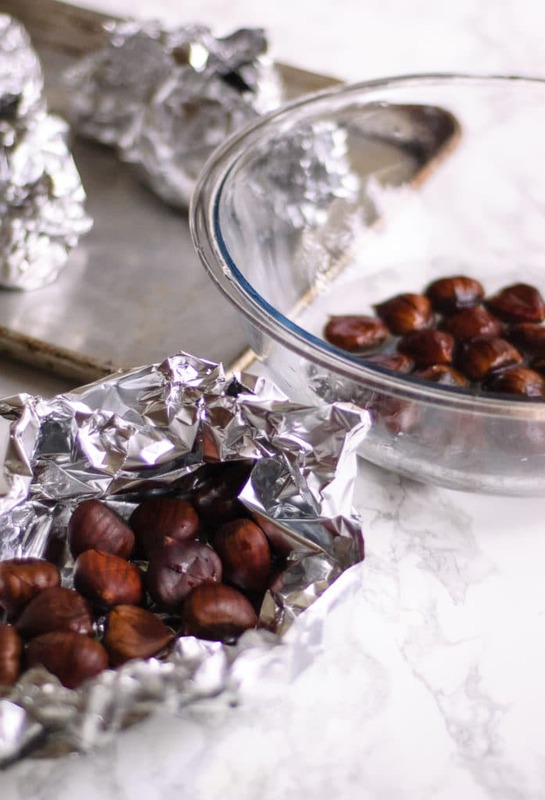 To roast chestnuts you’ll need a sheet pan, aluminum foil, a very sharp paring knife and some hot water. Here we go. Score. Very carefully use a sharp paring knife to cut an “X” on the flat side of the chestnut. Be careful, because they like to slide out from under you while you’re cutting. Use safety gloves if needed. Soak. 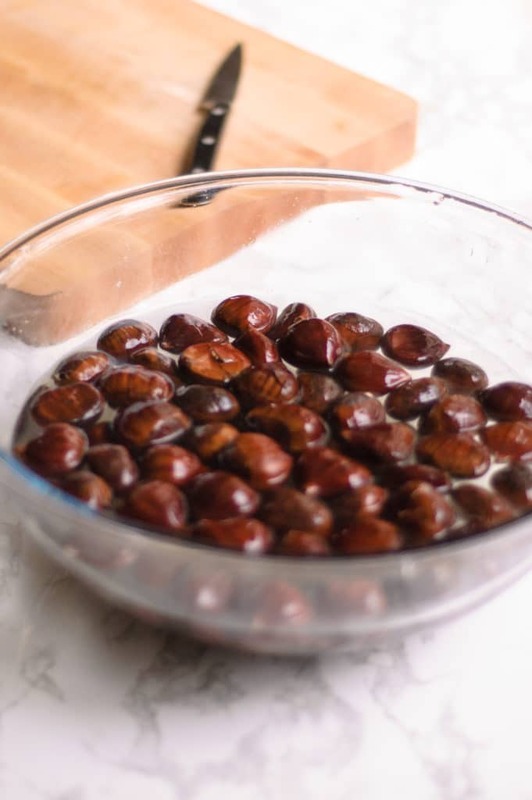 Place all of your scored chestnuts in a bowl and cover them with hot water. You can use boiling water if you like, but the hottest water your tap offers will work splendidly. Let them soak for about 3-5 minutes, or until air bubbles stop escaping from the score marks. Roast. Put the sheet pan in the oven and cook for 30 minutes, or until the corners of your scored “X” have curled back. Peel. 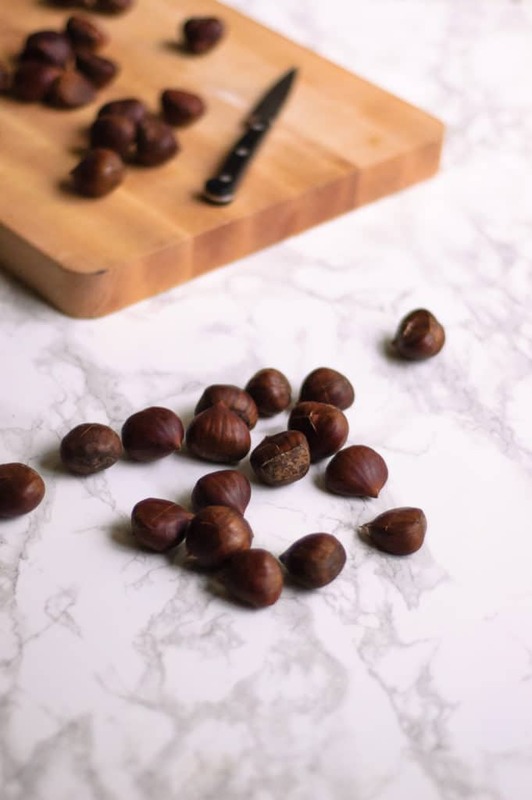 Open only one bag of chestnuts at a time and work quickly to peel away the skins. There are two different layers to deal with, the hard one, and a softer fuzzy one. Both need the chestnut to be as hot as possible for success. Repeat. Repeat until all the chestnuts are peeled. If they become too cool for peeling, place them back in the oven for around 3 minutes, then try again. 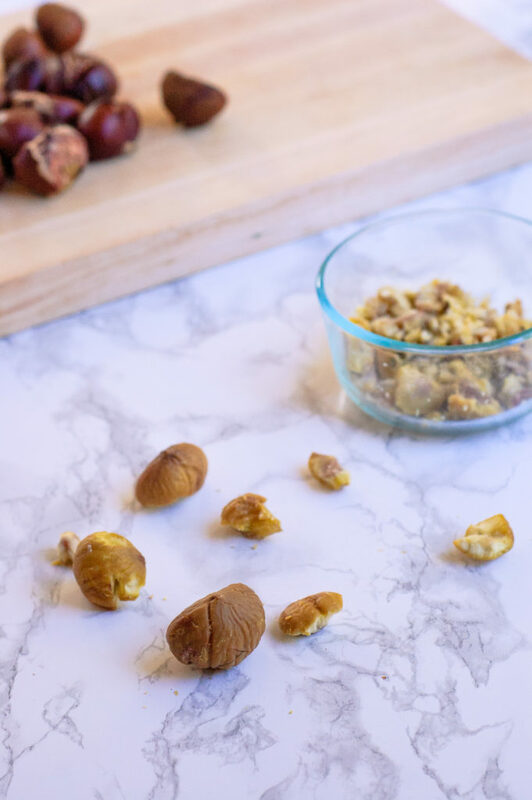 Do you have any tips, tricks, or hacks for how to roast chestnuts? What is your favorite way to eat them? Tell me about it in the comments or show me on social media – @foodabovegold. If you used this post to help you roast chestnuts, make sure to tag a photo with #CallMeMichelin so everyone can see it! What a great informative post! I roasted them for about 20 minutes, and some of them had a white foam oozing out of them! Does that mean they’re bad?? I’ve roasted chestnuts many times, but never seen this! I tried one that didn’t have foam, and it was delicious! Very very sweet! Anyone know why this happened? Hi Jackie! I don’t know exactly what causes the foaming, but it happens to me every now and then as well. As long as you got your chestnuts from a reliable source (which I’m sure you did), and you don’t notice any mold or other alarming features, I wouldn’t stress the foam. It is most likely just an extra abundance of starch, like when you boil pasta and the starch foam rises to the top of the water. If it concerns you enough, you can give the chestnut a gentle rub with a damp cloth to remove it before eating.